Westward Energy Services has provided first class service to the local authority, housing association and domestic users since 1984. 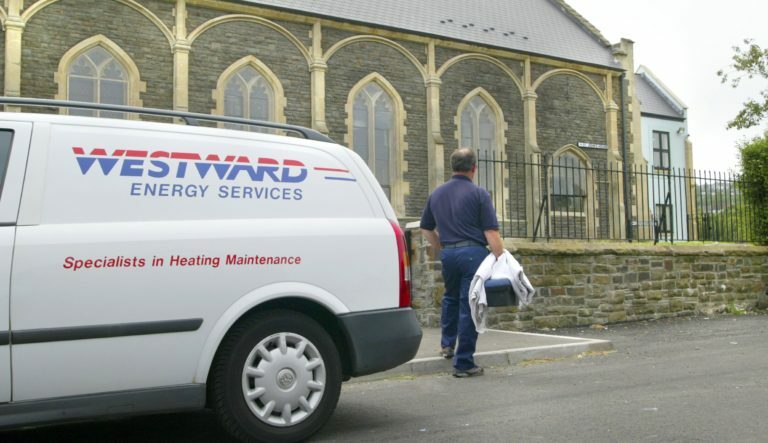 Westward Energy Services have over 30 years’ experience supplying first rate heating and plumbing services to local authorities and housing associations across South Wales. Any heating unit that has a 70kW power rating or above is classed as a commercial appliance. All of our heating engineers hold the relevant Gas Safe / Oftec accreditation that allows them to work with commercial appliances, so you can be sure you’re receiving the best possible standard of commercial boiler service and maintenance. Westward Energy Services have been installing, upgrading and servicing central heating systems for over 30 years. Westward Energy Services maintains over 18,000 Local Authority/Housing Association customers with maintenance service contracts. All of our Central Heating System work comes with a guarantee and we offer a full service package. We are a GAS SAFE & OFTEC registered company. We have also met the ISO 9001:2008 Quality Standard and ISO 14001:2004 Environmental Standard. Highly regarded for our experience, reliability and technical knowledge. Westward Energy Services is one of the few companies in the country with the capability and resources to manage high-specification service and maintenance heating contracts for a wide range of commercial and domestic customers. With over 30 years experience and a dedicated team of over 40 engineers using a highly-sophisticated computer network, Westward Energy Services operate from modern offices at Pontardawe in the Swansea Valley. All our gas engineers are fully-trained Gas Safe qualified to ACS (Accredited Certification Scheme) standards for gas operatives and Oil engineers to current OFTEC standards.